Keratomileusis), is laser eye surgery intended treat nearsightedness, farsightedness, and/or astigmatism and reduce the dependency on contact lenses and eye glasses. At Vista Eye, we use the latest technology for our pre-operative exams and vision correction procedures, including PRK and LASIK. All surgeries are performed by a fellowship trained laser vision correction and cornea specialist, Dr. Jani. The most common type of refractive surgery, LASIK, is an all laser procedure that can restore your vision. During LASIK, the eye surgeon creates a corneal flap with a femtosecond laser (i-LASIK) or microkeratome which is then folded over, so that the eye surgeon can precisely remove tissue from the cornea. By resculpting the corneal tissue, light focuses better into the eye, resulting in clearer vision. 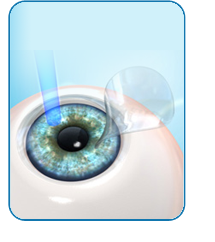 Excimer lasers can also be used to correct astigmatism by smoothing the surface of cornea to a more normal shape. The eye surgeon will first create a corneal flap using a femtosecond laser. After folding the flap back, Dr. Jani will use an excimer laser to reshape the cornea’s curvature to the precise correction (steepened for far-sighted patients, flattened for near-sighted patients). The laser treatment typically lasts 30 seconds or less depending upon the amount of correction desired. After the cornea is resculpted, the corneal flap is put back in place, like a natural bandage. The entire procedure takes about 10 minutes per eye, and patients are often ready to leave within an hour. The eye heals on its own within a few days with no need for stitches. The outer layer of the cornea, or epithelium, is a soft, rapidly regrowing layer that regenerates within a few days with no loss of clarity. In LASIK, the epithelium is not removed as in PRK; a flap is used to uncover the deep layers of the cornea. Thus, the recovery time is faster for LASIK. The deeper layers of the cornea, as opposed to the outer epithelium, have very limited regenerative capacity. At Vista Eye Specialists, we utilize the latest technology, including Intralase, Visx Star S4 excimer laser with advanced eye tracking and iris registration capability, and CustomVue Wavefront technology. With LASIK surgery, most people’s vision improves right away, but some find that their vision gradually improves even more over the next few days or even weeks. The recovery time for LASIK is typically 1-2 days. Eye shields are worn after the procedure and it is imperative that the eyes are not rubbed or disturbed for the first 48 hours or the corneal flap created during the procedure could be disturbed and lead to wrinkling of the flap. The various eye drops prescribed by your eye surgeon will help the healing process, while over-the-counter pain relievers may also be helpful to relieve any discomfort. Vista Eye recommends patients have a few days of rest for recovery. While some activities, like driving and going back to work can resume after a couple of days, certain activities, such as swimming and strenuous exercise, will be limited during the weeks following surgery to avoid any trauma to the eyes. LASIK involves creating a corneal flap and shaping the cornea, while no flap is created during PRK. Both PRK and LASIK can be done on both eyes at the same time, however, the recovery time is typically longer with PRK. For many patients, LASIK is their first choice for laser vision correction due to less recovery time and discomfort levels. However, PRK is a safe, successful alternative for patients who are not good candidates for LASIK or choose not to have a corneal flap for their laser vision correction procedure. Studies have demonstrated in the long term, PRK and LASIK are very equivalent procedures in so far as vision is concerned however the primary difference is the speed of visual recovery. By undergoing a comprehensive eye exam, Dr. Jani will be able to determine if you are an ideal candidate for LASIK. There are many factors that the doctor considers when developing a vision correction plan for you. At Vista Eye, we always consider the overall health of your eye, your current glasses prescription and your vision goals. After your thorough eye exam, Dr. Jani may decide that LASIK is not the best vision correction choice and may need to discuss other options in order for you to get the best vision results possible. At Vista Eye Specialists, we realize you have many options for laser vision correction. We feel that the right eye surgeon can often be the difference between a successful procedure and one with a suboptimal result. Asking the right questions is very important when selecting a quality surgeon. We have included this list of questions below to better educate laser vision correction candidates as to what they should look for when selecting a surgeon. Is your eye surgeon board certified and fellowship trained in Laser Vision Correction and Cornea? Does your surgeon perform other types of refractive surgery or LASIK only? Will your surgeon perform part or all of your refractive surgery (LASIK) evaluation? How long has your surgeon been performing laser vision correction eye surgery? What is your surgeon’s success rate with LASIK/PRK eye surgery? Does the eye surgeon see patients post-operatively? Do you feel comfortable with your eye surgeon and the level of personal attention you receive? ARE THERE RISKS WITH LASIK? With LASIK, as with all types of refractive surgery, dry eyes is the most common risk of surgery and can be permanent. Some LASIK patients have complained of glare and halos, but many times these symptoms are resolved after a few months as part of the healing process. Under or over correction of the refractive error is possible, especially with more severe myopia, hyperopia, and astigmatism, since the predictability of healing becomes less exact. If you are considering LASIK, schedule a FREE consultation with Dr. Jani, a fellowship trained laser vision correction and cornea specialist, to find our about what technology will meet your vision needs for the best possible outcome. After all your eyes are too important to trust to just anyone! Please contact Vista Eye for more information about LASIK technologies, or to schedule an appointment by calling toll free at (888) 393-5264. Has your glasses or contact prescription been stable for at least 12 months? Do you know your prescription? Do you wear reading glasses or bifocals? Over 98% of LASIK patients see 20/20 or better after surgery. The results of LASIK laser vision correction have been tremendous for literally millions of people. Despite the amazing safety and results of this procedure there are associated risks. Are you willing to discuss these risks with our LASIK coordinator?